Klean Kanteen's are 18/8 food-grade stainless steel beverage containers that come in 12 oz., 18 oz., 27 oz., and 40 oz. sizes. I received a stainless steel beverage container awhile back and love it. I can refill it with filtered water and carry it with me everywhere. I feel good about not throwing away plastic bottles and I don't worry about harmful chemicals leeching from my drink container. Did you know that 38 billion plastic water bottles are thrown out every year and only 23% are recycled. It makes so much more sense to me to refill a safe container that I can take with me and not have the waste of throwing out bottles. Because your Klean Kanteen is made of food-grade stainless steel you can fill it with any type of beverage as the metal itself is safe and will not leech any harmful chemicals or toxins. Click here to read more about storage container material concerns. Klean Kanteens are easy to clean. They are dishwasher safe or can be washed with a mild soap and bottle brush. One disappointment I had upon receiving my Klean Kanteen's was to find that they are manufactured in China. My concerns with this include fair trade, possible contamination with lead or other materials, and I'm very pro-American labor and American products. Unfortunately Ethos and Sigg (two of Klean Kanteen's biggest competitors) also manufacture in China so we don't have alot of other options. 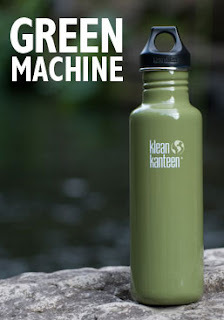 Klean Kanteen reassures it's customers that they participate in fair trade and maintain a set of prudent checks and balances to ensure that their products are produced safely and sustainably. Representatives of Klean Kanteen visit China several times a year to meet with management and many of the workers at production sites. They also allow major retailers to inspect their factories themselves. In addition, Klean Kanteens are laboratory tested on a regular basis to monitor product content and quality. This is particularly reassuring if you purchase a painted bottle - no lead! If you are interested in purchasing, check out their website. You can order directly from their site or you can find a retailer in your area. Also check out the cool accessories that go with these bottles. They have tons of different caps to choose from including a sports cap, stainless steel flat cap, they even have a sippy top cap. They have insulators, nylon slings, and a bike cage that fits the Kanteen. They even have a stainless steel Wine Karafe. Cool stuff! Do something for yourself and for the environment. Check out a Klean Kanteen today. I bought one of these in a sippy cup version for my 2 year old nephew (it comes with a BPA-free sippy top thing - can you tell I'm not a mom yet, don't know what you call those things). Anyway, HE LOVED IT! Of all his birthday gifts, he actually wouldn't put this one down. Made me smile from ear to ear. That is funny. I bought both of my kids the little, cute 12 ounce size from shhh... Santa. C. wants to hold it in the car and drink from it like mommy does. I didn't get the cool sippy cap - I need to get a couple of those.